The spectacular and painful bursting of Ireland’s property market bubble since 2007 has brought to an end what one could term Property Market 2.0 in Ireland. The country’s “Property Market 1.0” was built in the late 19th and early 20th centuries, when successive London administrations made huge amounts of credit available at preferential interest rates so that tenant farmers could buy their plots. Throughout the 20th century, the urban poor remained as tenants while only the tiny but growing urban middle class took part in any sort of mortgage market. “Property Market 2.0” emerged in the 1980s and 1990s, as competition among banks and building societies brought mortgages to the masses. Barely had this transformation time to take hold, though, then Ireland was a member of the Eurozone, with inappropriately low interest rates and a practically infinite supply of credit from global credit markets. Along with lax regulation of the banking and building sectors, the result was perhaps the biggest national property market boom and bust of the modern era. What will “Property Market 3.0” look like? As yet, nobody knows. It is safe to guess that, at least in its early days, it will be haunted by what has just happened. The worry is that initial prudence will eventually decay away, as institutional memory fades. The nightmare scenario is that at some point in the future, the 2020s or the 2060s, the lessons we’ve learnt are thrown away with a simple “Well, that could never happen now/This time it’s different/Insert self-deception here”. So what can we do? An idea I’ve explored at length elsewhere is the importance of information. Having an official real-time database of transactions prices doesn’t just help people like me churn out research papers. It gives normal people the information with which to make informed decisions about whether to buy or rent and for how much. And in doing that, it actually reduces the chances of a bubble as bad as the one we’re recovering from now happening again. The national house price register looks like it is now government policy, so today, I’d like to focus on a couple of other ideas. Aside from overly generous tax-free allowances, the lack of an annual property tax is the only way in which Ireland’s taxation system looks “out of kilter”. A property tax contributes about 10% of core tax revenues for the typical developed country, usually funding local government services. In Ireland, however, even stamp duty – which did nothing other than hinder labour mobility and make property more expensive – is now largely gone. To help end Ireland’s reliance on EU and IMF funds, we need a property tax. Specifically, Ireland should look to introduce a land value tax, where the owner of a property has to pay a percentage of the value of the land underneath the property in tax each year. This is the fairest way of taxing, as it passes on the cost to society of under-using potentially useful plots of land to those who are under-using them. It’s also a tax that doesn’t affect your incentive to improve your home. Taxing a fraction of your home’s current market value means that if you improve your home, say by making it more energy efficient, you then have to pay for that every year in taxes, which is silly. Lastly, by penalising the hoarding of land, a land value tax is another tool to stave off future property bubbles. One idea we should actively consider is a set-in-stone maximum loan-to-value ratio (or minimum deposit). The need for any sort of deposit at all reflects a market failure, where a lender has incomplete information about the ability of the borrower to repay in the future. Until recently, conventional wisdom was that higher LTVs (smaller deposits) reflected more efficient markets. Now, however, it’s clear it was a cover for greater leverage. The fundamental need for a deposit exists at all points in the market cycle… especially at that very time market participants are pushing the regulator to ease it. So, if we want long-term sustainability, we should bring in a minimum deposit. Think about this another way. People form their expectations about future house prices by looking at what’s happened the past few years. As a result, the principal cause of a housing bubble is what economists call a series of “positive shocks to demand”: something happens – say, lower income taxes, an influx of foreign workers, or a good year for attracting FDI – that pushes up house prices for a couple of years in a row. Now, suppose as this is happening, in response to pressure from banks, the politicians or the public, the regulator eases bank lending practices, enabling an extra 1% of the population to buy homes. Because only a small fraction (about 5%) of homes is traded each year, the new buyers represent a sizeable rush of new demand on to the market. The push for slacker lending conditions risks turning an increase in house prices into a bubble. A stylised example of this is shown in the graph above: two “demand shocks” push house price inflation from its natural rate of 2% a year up to 4%. The difference between the two colours is that in case 1 (orange), the regulator responds by relaxing deposit requirements. The bubble is where people’s expected house price inflation exceeds the fundamentals: on the graph, it’s that part of the dashed line above and to the right of the solid line. 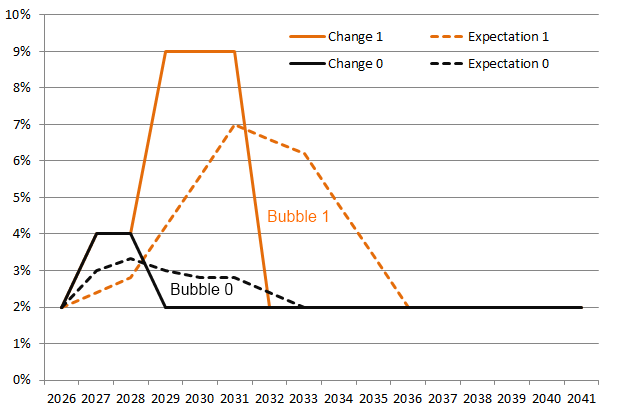 Black is where this is no easing of deposit restrictions, and the bubble element is small (3%). Orange is the case where deposit restrictions are eased and an extra 1% of the population buy homes over the course of three years. With this one difference, there is now a significant house price “bubble” of almost 15%. I don’t have a set figure in mind for this proposal – I could see arguments for anything between 80% and 92%. But one should be set and the sooner the better. This is because setting the deposit required in stone will give an amazing shot of certainty into an uncertain market. If the maximum loan-to-value is 90%, a young family looking to buy will know that to borrow €200,000, they will need to save at least €20,000 before they can go to the bank. My final suggestion is more controversial. It’s that we should ban variable rate mortgages. Much as it may surprise Irish readers, used to variable rate mortgages because Ireland had no idea what its inflation rate would be from one year to the next, many countries in the world have mortgages where the interest rate is fixed for the lifetime of the mortgage. In the US, the very concept of an “adjustable rate mortgage” was an early-2000s financial innovation that is now viewed in the same light as sub-prime mortgages and CDOs. Having variable rate mortgages exposes the borrower, obviously, to the risk of higher interest rates and thus to the risk of cashflow problems. A fixed rate mortgage has the substantial benefit of providing certainty of expenditure to the borrower. It also focuses the lender’s mind at the outset about its own costs of borrowing. And there is also a wider economic justification. Ireland no longer sets its own interest rate. As a result, when the country needs stimulus, the rate can be too high, prolonging recession. Banning variable-rate mortgages closes down one channel through which interest rates set in Frankfurt can bring about recession in Ireland, as households would no longer face cashflow constraints when ECB rates rise. Again, by bringing in this change in the middle of the “post-storm eerie calm”, the Government can help the market find its new floor. If I know that not only do I have to save up a 10% deposit but also that I must allow for a 7% interest rate on my mortgage, my house purchase and monthly budgets are suddenly an awful lot clearer. Conversely, trying to do this after a new equilibrium has emerged in the property market would be very tricky, as it would almost certainly push house prices down further. The economic crisis and the huge amount of uncertainty in the property market at the moment presents the Government with an unprecedented opportunity to mould Property Market 3.0. To give people information on which they can base their actions, we need a national house price register. To promote the best use of land, we need a land value tax. To prevent one of the most common causes of bubbles, we need an immutable minimum deposit requirement. And to eliminate uncertainty and reduce ECB-induced recessions, we should take the bold step of banning variable rate mortgages. 1. Hand in hand with the property database, our property purchasing mechanism would do well to mirror the Scottish system. An asking price is published (which can be compared to the database) and then sealed bids are tendered to solicitor by a closing date. Highest bidder wins – this would have enormous benefits fir house buyers in reducing uncertainty. 2. Longer term fixed rate mortgages, such as available in the US, would be something I’d like to see made available. 3. Right now, we need a Credit Review Office for mortgages. Banks are not lending to anyone except civil and public servants at the moment, as bourne out by Central Bank report yesterday. This is despite, in my case, being over qualified in terms of repayment ability, to borrow the amount I’m looking for. In relation to last point, it’s being said that banks didn’t follow the right procedures during the boom when approving mortgages. It’s quite obvious that today they’re also not following those lending procedures. Where it used to be “yes@ no matter what previously, it’s now “no”, no matter what. Once and for all implement the Kelly report? Ronan, thanks for another great piece. I have a question about the fixed rate mortgages. A 25-year fixed rate mortgage may provide certainty of expenditure to the borrower but surely it leaves the lender open to significant losses, if interest rates were to increase substantially? It may reduce the credit risk to the lender (ie, the risk that the borrower can’t pay back the mortgage) but it does raise the interest-rate risk. Or is there something I’m not seeing? Thanks for the question. The idea would be that banks have to think about lending before they do it. For example, Danish banks work under a model whereby if they want to lend €200m out in, say, a thousand 30-year mortgages, they have to go off to the markets and borrow €200m on a 30-year bond. They then find out pretty quickly what rate of interest they have to pay and thus they set their mortgage rate based on that. The current system – offer someone a 3% rate for the first 18 months and then sure who knows what’ll happen twenty years down the line – is, for obvious reasons unsustainable! I’d like to see something like the Danish system replace it. Very interesting blog article, thanks! I was just thinking about the issue of mortgages tonight and wondered… why do we even need them? Could we not just require that people have a 100% deposit? After an initial (maybe nasty) price shock, would the market (i mean supply and demand) not just realign itself to the requirement after a while? I can’t see the maths for _who_ can afford _what_ house being affected. I’d imagine that house prices would just be a fair bit smaller. Would this type of requirement then leave people free to waste their credit on other stuff that wouldn’t have the possible affect of them losing their homes? Just a thought! I’d be interested in understanding just where I’ve gone wrong with my assumptions. Following on from your response to Tara’s question there is a risk of early repayment from the borrowers. What would you suggest in these circumstances?